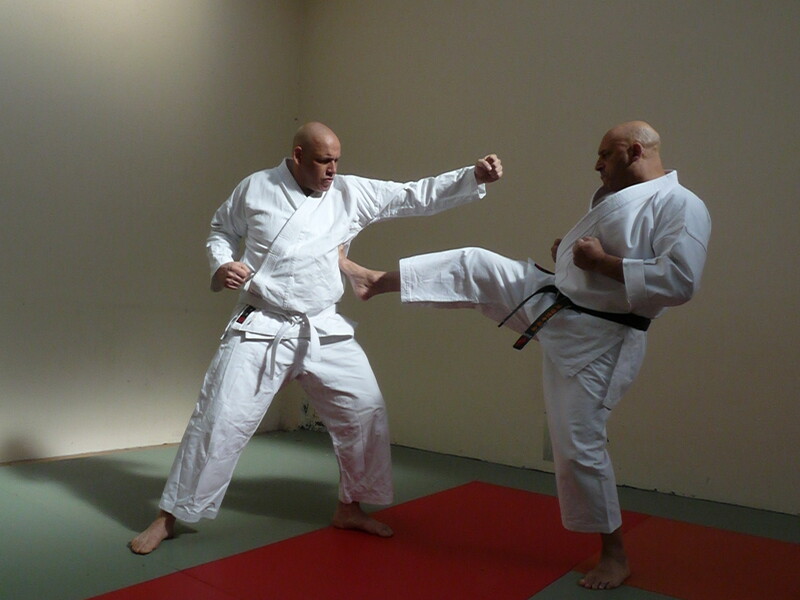 There have been many occasions where I have used my Karate when I was in the protection and security business. These were times when I made techniques work for me to great effect. I thought I would share a few with you. It was a usual Friday night for me. Friday nights start early as I take two bus rides across town to train on the lower grade session, but I manage to get half the higher grade session done before I have to leave a bit early to get picked up from the Dojo and go to work as a doorman at a top city night club. On this particular night, it was just solid basics. When I say solid I mean real hard, tough basics which consisted of Meageri (front snap kick) Gyaku –zuki (reverse punch) as individual techniques and as various combinations. For some reason this particular night, we did drill after drill of them. This happened over both of the sessions and the drills seemed to be hard and relentless. I was only too happy to finish the senior session early. After training I showered and dressed ready for my work, black suit, white shirt and dickey bow. I was picked up from the Dojo by a work colleague and we both headed off to the club. Friday nights were usually very busy this one was no exception. The night club that I worked in was very popular and Friday night was the lad’s night out in this particular city. I had nothing in particular to report up until about 12 o-clock at night. I had just left the main doors and was walking towards the main dance floor, there was a bit of a scuffle between a group of about 3 or 4 lads. The area around them was quite crowded as the scuffle broke out. As I began to make my way through the crowd they drew back away from the confrontation and within that instant I spotted one of the lads holding a glass which he broke against the wall. In retrospect I think he was doing it defensively as he held it out in front of him as a challenge to the other lads. However I reacted instinctively to that being the main danger, so within that given instance that nights basic training kicked in immediately and so did I. It was a sharp double step with front left leg Meageri to the wrist holding the broken glass, as I stepped down I landed a right reverse punch to the lads jaw. The kick knocked the lads arm up in the air, the glass was released to land embedded into the ceiling, and fortunately it stayed there imposing no further danger. As the punch impacted the lad took off flying down three tiers of stairs to land in the middle of the dance floor. Everybody in the near vicinity quickly dispersed. The only person that didn’t move was the bloke lying in the middle of the dance floor. It was about 5 minutes before he came around, which was about as much time as it took for the ambulance to get there. It was reported back by the usual grape vine that he had incurred a broken wrist and required his jaw to be wired. On top of all that he was banned from the club for life. I’m not relating this story in any way to glorify or boast about my actions. I was merely doing the job that I was paid to do and acting decisively in protection of the public but I have told this story to emphasise the nessecity of repetition of techniques to hone your art. The timing and distancing of this engagement was spot on.